Mohammed bin Rashid honors winner of "The Most Innovative Government Experience"
HH Sheikh Mohammed bin Rashid Al Maktoum, Vice President and Prime Minister of the UAE and Ruler of Dubai, affirmed that the promotion of global development and the acceleration of its pace to the future at a steady pace requires the participation of the governments of the world in instilling a culture of innovation and cooperation to face challenges and ensure a better future for mankind. All. 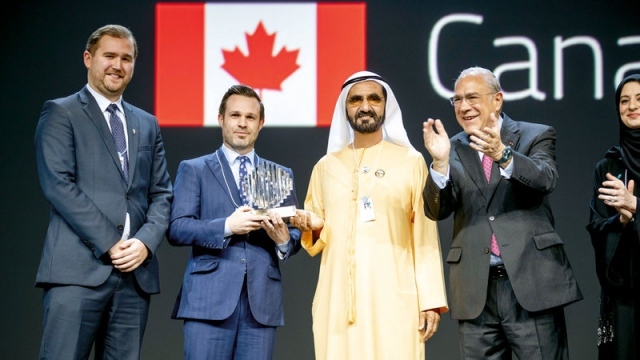 The award comes as Crown Prince of Canada, winner of the world's most innovative government experience, was honored for the Carot Rwords initiative, an initiative to encourage the community to exercise at the World Summit Awards. His Highness Sheikh Mohammed bin Rashid Al Maktoum said that the quest for a better life is driven by creative thinking. He pointed out that the governments that innovate today are creating the future for their peoples and the world by anticipating the challenges and facing new solutions and ideas that contribute to the development of government work. Human-centered civilizations are the foundation of global development. His Highness pointed out that enhancing the work of governments with creative innovations contributes to meet the aspirations and aspirations of humanity and improve the quality of life in the world, a role that governments should focus on in the next phase to keep pace with changes and move to the future. The future in all fields of government work. He congratulated the award winning team, who worked hard to provide the best innovations, calling on innovators and innovators to continue their efforts, take advantage of the challenges, transform them into opportunities and participate positively in creating a brighter future for humanity. A global laboratory, and an inspiration to all governments of the world.